These distinctive scars are at Northburn on the shores of Lake Dunstan, Central Otago. 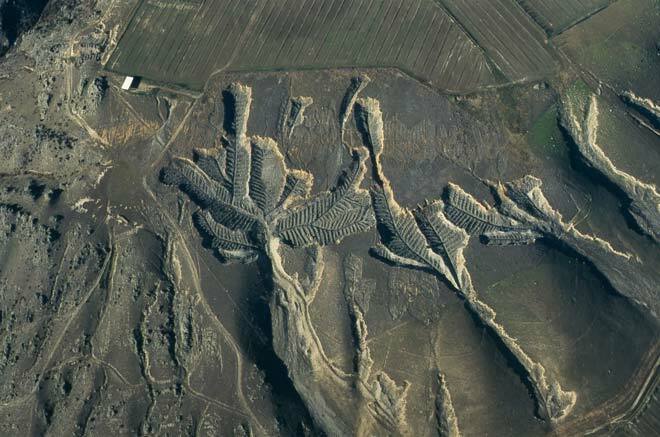 The gravel terraces have been sluiced away and large boulders have been stacked in rows along waste-water channels to produce this fern-like pattern. Vineyards have been established nearby (upper right). Its not actually vineyard showing at the top of the image as mentioned in your caption - those are border dykes which is a pasture irrigation system commonly used in Central Otago. There are vineyards nearby but some distance from the Herringbone Tailings - not alongside them.